The objective of the Hatfield Hospital was to create a hospital of the future which serves as a town center for the adjoining complexes. 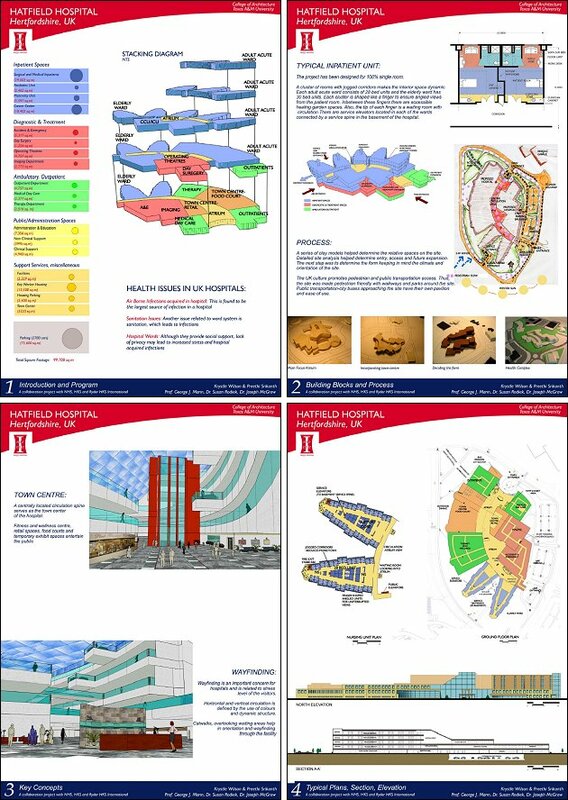 The 1.2million square feet, 920 bed hospital in Hatfield, UK was a semester long challenging third year undergraduate healthcare project. The initial stages of the project involved a trip to UK for a detailed site analysis and case studies of existing hospitals. In UK. we were introduced to practices of UK healthcare system with the help of National Health Service (NHS) and the Future Healthcare Network (FHN). In short, the task was to choose two key concepts/objectives and design a facility for the future. To design a healthcare facility one must think from three different perspectives: patients. medical staff and families. A patient room module on a 10m grid was developed designating patient, clinical and family zones. We accounted for a flexibility of decentralized nursing stations within the inpatient towers. A finger shaped nursing units were created to angle the views from rooms ensuring privacy. Stepping to the south, the towers gave way to healing gardens in between the fingers. Based on evidence (better sanitation, faster recovery and other factors) the future hospital was designed to house 100% single patient rooms. The hospital is not an institution for the ill but a place for fast recovery and staying fit. Keeping this thought in mind, the project aimed at creating a town center with a central spine connecting two huge neighboring complexes. The ground floor of the facility housed food courts, shops, exhibition centers and hallways and fitness/wellness center inviting people to use and pass through the facility on a day to day basis. We did not want the building to impose on the site but blend into the context. By incorporating way finding techniques architecture can reduce stress level in families and visitors: Color coded circulation cores and open floor plans helps one in orienting oneself in the huge facility and makes the place livelier. Family waiting areas are placed along the central spine and towards the end of each inpatient tower finger. From a medical planning perspective, departments are placed keeping in mind easy access and adjacency of various components. For example, the elderly wing is placed on the ground floor and has a separate drop off The Emergency Department is placed for an easy entrance from the highway. The issue of parking has been addressed by providing a certain amount of underground parking (mainly for staff) considering a natural depression of about 5′ to 6′ in the site. The Hatfield hospital, a facility of future is designed keeping in mind flexibility and advancement of technology. The project was a challenging puzzle with various pieces to it and a good learning experience.